How can I limit the number of Standard backups? Portable jobs run weekly and take the contents of the weeknow directory and put it into Portable directory structure ([n]-week[nn]-[year] under the backups directory within the profile. If you don't set a limit of the number of Standard backups to retain, then the number of backups will be determined by the number of Portables you keep plus whatever accumulates during the week in the weeknow directory (until the next Portable job runs). Customers with low disk space may want to limit the number of Standard (daily) backups to keep. The number you specify will be the exact daily backup count that Reload will retain, which means that Reload will keep a count of what is in the Portable directories as well as what is in the weeknow. When it reaches the threshold you set, the oldest backup will be deleted from within one of the Portables; thus, at this point, it expires a Standard backup on a daily basis. To limit the number of Standard Backups your system retains, open the terminal Reload menu. Go to Administer Profiles | [select your post office profile] | Configure Standard Backups | Advanced Standard Backup Settings. First, set Limit Number of Standard Backups Kept to Enabled. 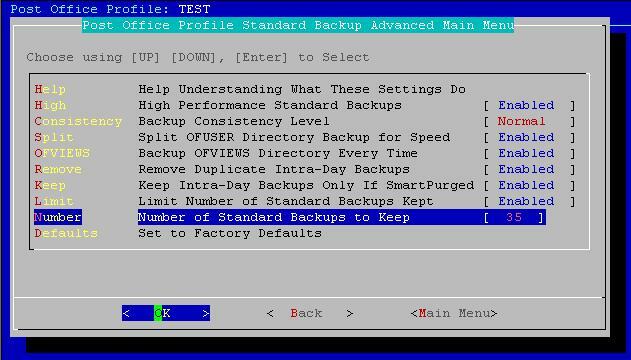 Then select the option Number of Standard Backups to Keep. This article was originally published in the GWAVA knowledgebase as article ID 1023.